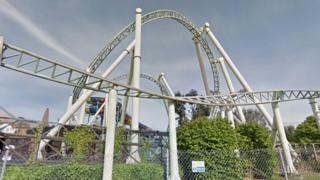 A theme park is objecting to plans to build new retirement homes nearby because it fears residents may complain of screams from people on the rides. Thorpe Park bosses say they are considering legal action over a planning application for a retirement home complex next to the park. They say the development could be "detrimental" to the park's business. A planning application for the development of a neighbouring Grade II listed building has been deferred. The application for the development next to the Surrey theme park had been due to be approved by Runnymede Borough Council on Wednesday, but was delayed while discussions between the park's owners and developer Eden Retirement Living continue, according to the Local Democracy Reporting Service. Merlin Entertainment said the development of 79 apartments could impact future investment at the attraction because residents might object to noise coming from the rides and visitors. In a bid to "protect its position" the firm said the impact of the complex would be "significant and detrimental to its ongoing operations". Linda Gillham, councillor for the Thorpe ward, said: "The main problem is that future residents may complain about noise, but in recent years the village residents have not complained about noise." A noise survey carried out in July 2018 found that "noise emitted from the theme park consists of screams from patrons and the noise created by the passing of a roller-coaster car". The application has been deferred until a later date, the council said.